There’s debate over whether the ref waited too long to stop the fight in Saturday’s light heavyweight championship bout between Jon Jones and Daniel Cormier, but maybe the real controversy should be over why a clearly concussed and struggling Cormier wasn’t allowed to immediately leave the octagon after that. 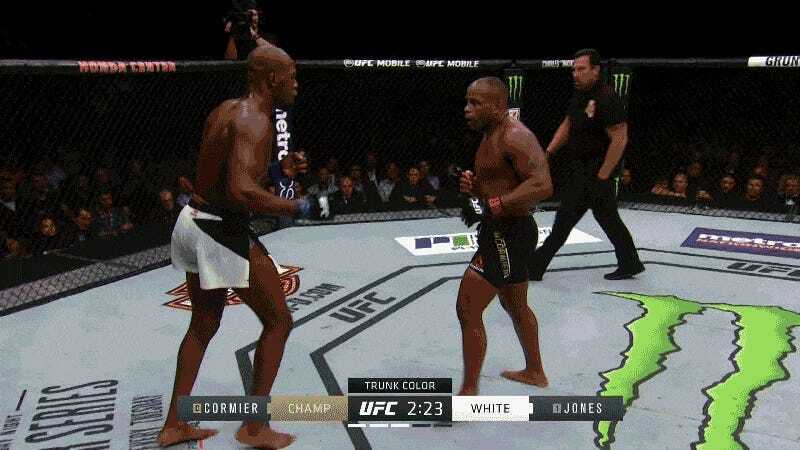 Cormier suffered a third-round knockout at the hands (leg) of Jones, who caught him with a flush head kick, then pursued him to the ground and rained a dangerously long series of punches on his prone form before the referee waved things off. Dana White said the fight could have been called off “three, four, five punches earlier.” Referee John McCarthy tweeted, “I should have stopped the fight two punches earlier.” It was a disturbing ending, but maybe not even as disturbing as what happened immediately after. This ISO cam followed Cormier the entire time, and it shows him unsteady and in need of medical care, and being denied it for the sake of good TV. After being pulled to his feet by his corner, Cormier stumbles toward the octagon’s exit at 0:25, clearly trying to leave. He’s blocked from doing so by a number of officials. At 1:09, they try to get him to sit on a stool, but he refuses as he barks at the referee. Why was he still in there? So he could stand by for the cameras when the ref raised Jones’s hand. At 1:35 of the video, Cormier is herded to the center of the ring for the decision, but it’s not ready so he tries to leave the octagon again. He’s again stopped, and spoken to by officials including White. 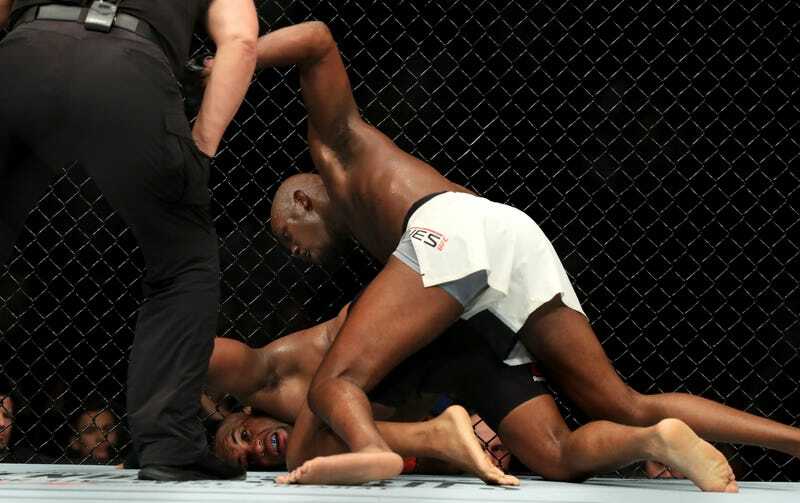 Finally, at 2:03, he wanders back just in time for the ref to declare Jones the winner. Even then the UFC wasn’t done with him. Rogan asked a second question, about the rivalry, before Cormier was finally allowed to leave the octagon. Cormier’s trainer, Javier Mendez, was furious that Cormier was forced to stay and answer questions. Dana White said there was a mix-up, but defended the interview. Rogan admitted on Sunday that he fucked up. Cormier was, to no one’s surprise, diagnosed with a concussion. He was held overnight at UC Irvine Medical Center and released on Sunday. Late last night, Cormier posted a message to his Instagram account. In it, he apologized to referee John McCarthy and thanked him for letting the match go as long as he did. As always, a fighter immediately following a fight is the last person who should be counted on to watch out for his health and his best interests. That’s on all the people surrounding Cormier, and most of them failed him.